Honestly, there's no question that this collection was the best out of the three. It was sophisticated, well-made, and had a great dystopian, futuristic theme that kept me interested the entire time. It wasn't the most original perspective, but measured along with the other collections, it was the most unique. The lack of color was a bit disappointing, but there's no denying that playing it safe with all black makes it very tasteful when it easily could've been ruined with garish colors or lame, as is often the case with futuristic lines. The styling was severe and striking, which played off the clothes really well. When this came out, I jumped out of my seat. It's not necessarily the greatest look, but compared with the other collections, I knew immediately the tone of the show when this came out, and I also knew it was going to be interesting. And, isn't that what the opening look is supposed to do? Very successful. Great coat, even greater from the back; very wearable, but also interesting. And fabulous accessories, even if that purse looks a little too precious compared to the rest of the look. I liked this top, especially the neckline, but not with the ill-fitting leggings and leather opera-length gloves. The lattice work, though, was impeccable and striking. I'm not a fan of the extended sleeves, or the drop waist on a coat that length, but the knits were a highlight in this collection. The collar could've been a little bit smaller, though. Actually, everything could have been a bit smaller. 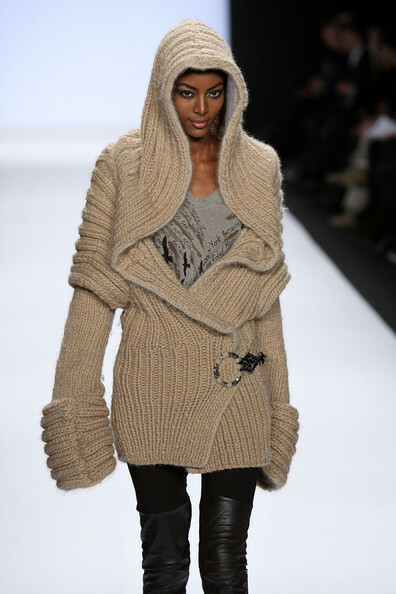 Urban, chic, with a vaguely Inuit undertone, which I found fantastic. I love the buckle and the graphic t-shirt, but she has a bit of a spare-tire from all the bulk. Still rocking the "Eskimo of the Future" look, and kudos. It's great and wearable. I just hope that fur is faux. The asymmetry on this looks like a mistake in the picture, but on the runway it created a very dynamic shape from the side. I'm not super-crazy about the leather bodice or the sort of imbalance with the skirt since it looks a little bottom-heavy, but it's cool and almost gets the point. I still like collars to, you know, be collars and not huge caplets but the jacket is pretty nice. However, for me, the best part of this look is the t-shirt. I would buy that in a heartbeat. Classic and simple, which is exactly what this collection had been lacking thus far. It's still a little bulky, though. The shirt, again, is fabulous. Very Stephen Sprouse-y and uber-urban-chic. The sweater's ok, but the tights...annoy me. The whole layering lattice motif ran the risk throughout the whole collection of making it looked overworked, and this is one instance where it's noticeable. This, however, I loved, despite all the aspects competing with one another. Very detailed and interesting, and, combined with the overall styling, made a great look. Very editorial. I wish the sweater-y thing was a bit more refined and focused, but still it's striking. Hate the gloves with that tank dress and, ultimately, this was not a very memorable piece. I felt that I had already seen this. It's kind of gorgeous, but to me, this looks like student work. It just seems like something a senior in a fashion design program slaves over for months, trying to whip out every technique he's good at into one overworked dress to get the attention of his professors. The layering gets really sloppy in the midsection and the top, and the one strap looks like an afterthought. The bottom, however, is breathtaking, and I guess the dress does a pretty good job of anchoring the collection. Ultimately, it was a good collection that balanced "wearable" with "editorial", was (for the most part) well-executed and had the most distinct point of view out of all of the others. And that equals "winner" in Project Runway land.